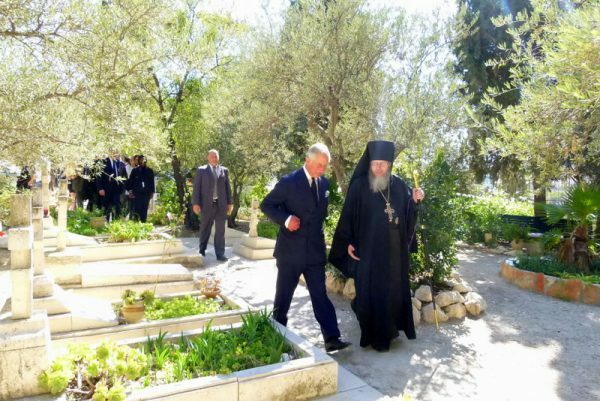 On Friday, September 30, 2016, concluding his visit to Israel for the funeral of Shimon Peres, Prince Charles of Wales visited Gethsemane Russian Orthodox Convent. Archimandrite Roman (Krassovsky), Chief of the Russian Ecclesiastical Mission in Jerusalem, greeted the royal guest at the gates of the convent and told him about the history and daily life of the monastery. Fr Roman, standing on the courtyard of St Mary Magdalene Church, which overlooks the Old City of Jerusalem, showed Prince Charles the Church of the Resurrection of Christ and the other holy sites of the holy city. Abbess Elizabeth of Gethsemane Convent, standing in the doorway of the grand, royal church, welcomed the prince and offered him the traditional Russian bread and salt. As the troparion to St Mary Magdalene was sung, Prince Charles approached the crypt of Holy Grand Duchess Elizabeth, upon which he laid a bouquet of flowers from the homeland of his grandmother, Princess Alice of Greece, who was a niece of the saint. The royal guest then lit candles at other holy relics of the church. Addressing His Royal Highness with warm words of welcome from the ambo, Fr Roman intoned Many Years to him and the Royal Family in English. 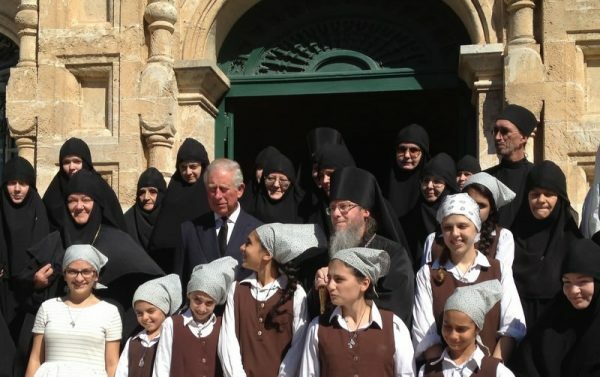 The Heir to the British Throne then spoke with the nuns of Gethsemane and the students of the Orthodox Bethany School for Girls (administered by Gethsemane Convent) as he emerged from the church, after which he headed for the crypt of Princess Alice. 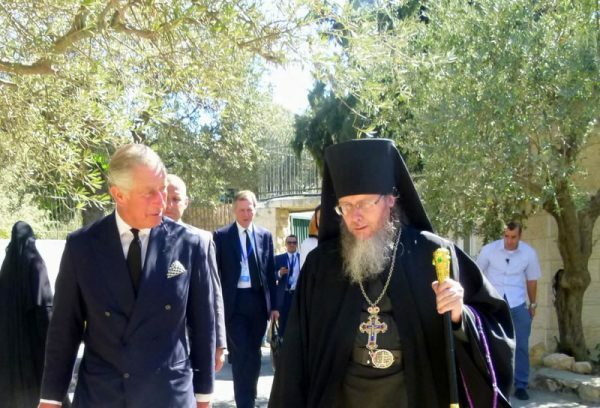 Archimandrite Roman then performed a brief litany of commemoration, after which Prince Charles laid down flowers upon the grave and lit a candle. He then viewed some old photographs that the convent had preserved over the years. Prince Charles then requested to remain alone in the crypt. 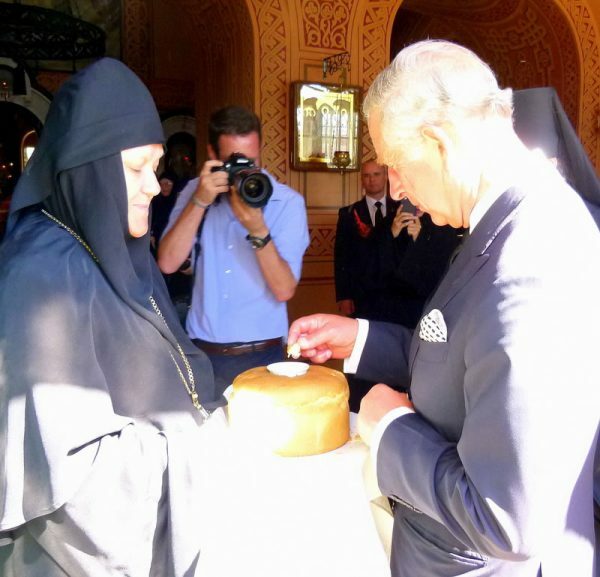 Honoring the memory of his grandmother and expressing his profound gratitude to Archimandrite Roman, Abbess Elizabeth and her nuns, Prince Charles then departed to the airport.